Dropbox is an incredible tool. With this little piece of software (which is also a web-app) you can access your files from every device you own. I use Dropbox on my Mac, Nexus 4, iPad and iPad Mini. And every time I need access to any file in my Dropbox – I will have it. The conventional way of using Dropbox is simply to keep your files in sync across multiple devices. But what else can you do with this tool? Here are some creative and useful ways to use Dropbox. Did you ever want to have offline access to all Facebook pictures you upload from your phone or even pictures you have been tagged in? 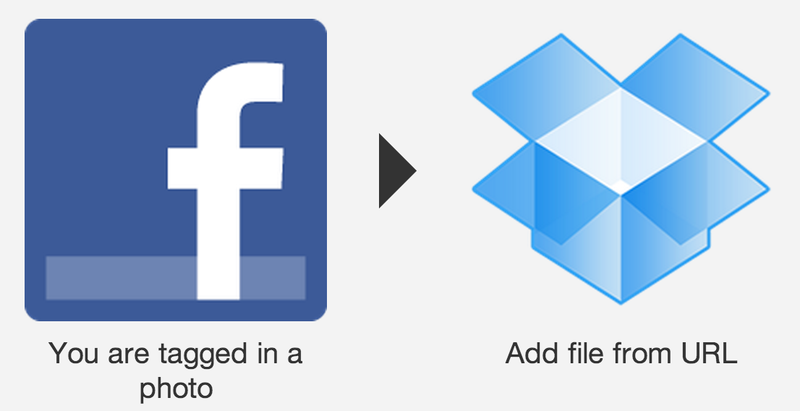 Use IFTTT to download the pictures automatically to your Dropbox. Check out other useful IFTTT recipes to automate your online activities! Dropbox allows you to host files in the cloud. This means that you can host your website in the cloud! With the help of DropPages you can host your website on Dropbox with your own sub-domain (yourwebsite.droppages.com). Not every computer thief is smart enough to uninstall all internet-enabled software from your computer. Once the stolen machine gets internet access you will be able to see your computer’s IP address through the Dropbox account security page and track it down. When it comes to smartphones – enable the auto-upload of pictures taken from your phone. Now, every time the thief takes a picture it will be uploaded to your Dropbox, which will help you to identify the thief’s identity. Wouldn’t it be great to have your apps in sync across multiple computers, so you don’t have to change settings all the time? With Dropbox you can install portable apps and access them on multiple devices – without losing any settings and tweaks you have made before. You can download all kinds of portable apps from this website. What if you want to print something on your home printer but you aren’t at home? Just put the document you want to print into a special Dropbox folder! A Script on your home-based computer checks a certain folder in your Dropbox for files, prints and deletes them afterwards. Digital Inspiration has published a step-by-step guide, which will help you to set everything up. Change your local game-progress save location to a folder in your Dropbox and continue to play where you left off on a different machine. Great to keep Minecraft worlds in sync. For webmasters: Use Dropbox as a local root folder for your website and make changes from anywhere you are without messing up your file structure and creating duplicate HTML/CSS files. A simple way to automatically back-up your documents without having to think about it is to make Dropbox your default “My Documents” folder. Now, every time you save a document it is backed-up and can be accessed from anywhere. Check out Microsoft’s guide, which will help you to change the location of your “My Documents” folder. Here at trendblog.net we use Dropbox to keep all our blog-related documents and files in sync; everything from texts and pictures to website back-ups. Dropbox is only one of the online collaboration tools we use to work efficiently. Let’s say that you have to share a big file with somebody. This file is already in your Dropbox, but the recipient doesn’t have a Dropbox account. This is no problem at all! Simply right-click your file and go to “Dropbox > Share link”. This will generate a URL to your file. Everybody who has this URL can access this file from now on and can download it anytime he/she wants. Dropbox is not just about keeping all your files in sync. You can do so much more with it! I hope this post showed you some interesting ways how to use Dropbox and make you work more efficiently. Need more free space? Check out our guide to getting free Dropbox space in under 5 minutes! Please share your favorite Dropbox uses in the comments!